Narrative of love / acrylic on gallery wrapped canvas / 16"x 20"x 1.75"
Available through me directly or here at Saatchi online. You may remember that about a month ago I was seriously thinking about changing professions. I was having a difficult time finding buyers for my work and feeling rather blue about the whole state of affairs. Or maybe I just told that to a few friends ; ) Anyway, this week I sold a number of paintings which is far and away a major personal milestone! I am so thankful to those who felt something in my work, and connected with it, and wanted it in their homes and offices. THANK YOU. You know, this business can be tough. I paint and paint and study and pour over books of beautiful works, and talk with people...and there can be looong dry spells. And then one day, it all kind of cumulates and presto. A bunch of good things occur. Si ce n'est pas un récit d'amour je ne comprendrais pas ! Un beau récit que d'apprendre les ventes de votre peinture. Toutes mes sincères félicitations. Parfois moi aussi j'ai des doutes, la vie d'artiste n'est pas simple du tout. Il faut juste rester soi, mais j'avoue que c'est plus facile à dire qu'à faire ! Cette dernière peinture est remplie d'optimisme et de couleurs très harmonieuses, un beau mariage. 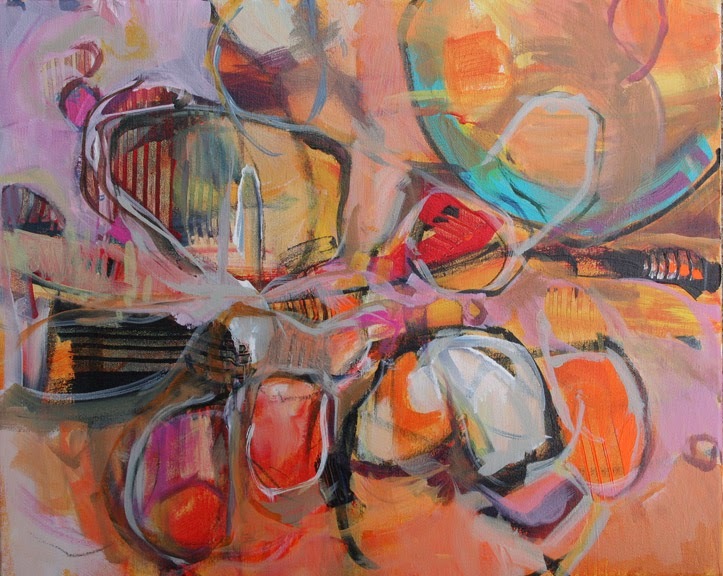 This painting has beautiful organic shapes and colors. Wonderful. Huge congratulations on the sales and validation. Kim, you are a wonderful artist and inspiration! Please continue. Thanks friends. Yep. We must keep painting! 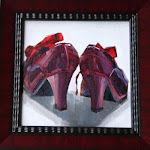 : ) Karin Lynn, I sold 3 through a gallery, shop and restaurant respectively. Two were purchased by a friend of one of my friends who had shown her my work online. All of these things have been done before, but intermittently...I guess it's just that it all piled up in one week after such a long spell. I love your work Karin and totally encourage you to keep at it! Such a great feeling.Your hard work and creativity validated. Just plow ahead. Your abstacts are really beautiful..Are they what were sold????? What great news, Kim. I'm so happy for you. 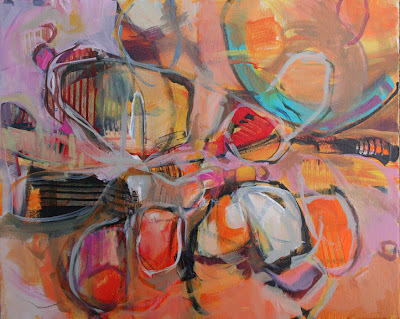 I'm so curious to know about your thought process as you create these beautiful abstracts to completion. Thanks. For those interested in a breakdown, it was 1 daily (still life), 2 abstract and 2 landscape. Don't ever stop Kim! Your paintings get stronger and more wonderful every day (and they were great to begin with). The only thing keeping me from adding more of your work to my collection is finances, but that's just for now!!! That is fantastic news Kim! And well deserved results for your hard work. This IS a tough business and the quiet periods are hard on the esteem and motivation. What you have been working on lately with the abstracts is so exciting and I love the energy you have in your posts when you talk about them. Keep going, you are inspiring many of us!